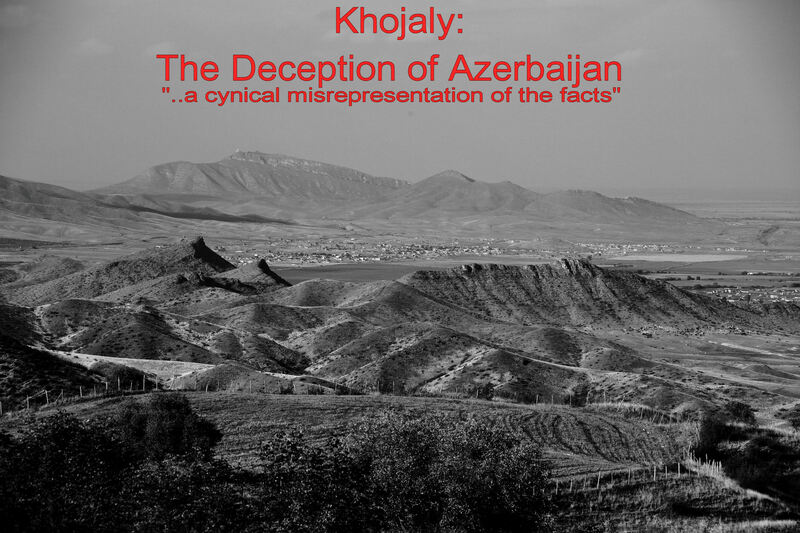 Home › War and its Legacy › Do Azerbaijani’s in London really understand about Khojaly and Karabakh? 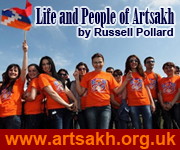 Do Azerbaijani’s in London really understand about Khojaly and Karabakh? Each year in London there is a short march by the Azerbaijani community to highlight their perspective on the events in Khojaly and this year I took the opportunity to witness it directly and to endeavour to find out more about their viewpoint. About one hundred people gathered in Trafalgar Square; all were in their early twenties. I had expected to see many banners of the various photographs that are widely reported as being from events in Turkey, Bosnia or Kosovo; on this occasion there wasn’t any. Most of the people in the crowd were simply wearing “Justice for Khojaly” T-shirts. The only poster that seemed to have been made for the day was a big picture of the Google homepage, with the words “Khojaly Massacre” in the search box. The group made its way, very quietly, down Whitehall, past the Prime Minister’s residence, down to the Houses of Parliament. They collected on the side of the road, opposite Big Ben, and unfurled a few more posters….and became a curiosity for the tourists. The occasion seemed to be more about a “photo opportunity” rather than a group of people with a strong passion for their cause. I took the opportunity to approach one of the protestors to establish what they felt their objective was for this event. The young guy that I spoke to proceeded to give me a brief overview of the standard Azeri story behind Khojaly, and then explained that this was following the Armenian invasion of Karabakh. I asked him how he felt that this was an invasion when the Karabakhi’s had voted to leave Azerbaijan and join Armenia in 1988. He dismissed the validity of the vote as, in his view, at the time, there were only Armenians living in Karabakh. I queried with him, how this could be the case when this very march was highlighting the deaths of Azeris in 1992, in Karabakh; I also highlighted that there were many Azeris in Shushi and in villages throughout Karabakh in the early stages of the conflict. I asked him if he understood why the Armenians felt it necessary to take Khojaly – which he didn’t. I advised him of the continual bombing from Khojaly and Shushi, of Stepanakert, by illegal GRAD missiles, as well as the humanitarian blockade. I suggested that the numbers killed in Stepanakert would, most likely, be greater than those that the Azeris were alleging in Khojaly. He hadn’t heard of the attacks on Stepanakert. When we discussed where the alleged killings were, he refuted completely that any of the bodies were near Azeri occupied territory, and that the “massacre” principally occurred within Khojaly, itself. The dialogue stalled when I questioned the validity of the pictures that are often published on “Khojaly”. Our conversation moved onto the mass movements of Armenians and Azeris during the war which has now resulted in separated Armenian-Azerbaijani populations. He was quick to point out that this was not the case and that there are 30,000 Armenians living in Azerbaijan. I questioned whether they were living openly, and freely, or covertly. He was clear that they were living freely, and that they were in no danger. I had no evidence to refute this, albeit that I found it most unlikely that this was the case. He offered to send me details that supported this assertion; I’m still waiting to see this. The guy I was speaking to was a reasonable person, and I asked him to consider the position of the ordinary people “just like us” who were living there now. A good proportion of those people would be of an age where they were either not born at the time of the war, or would have little recollection of it. What is the fairest and most appropriate way forwards recognising this? 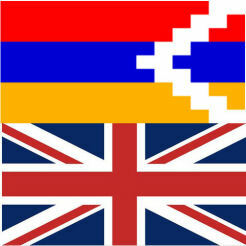 Surely the sensible approach would be for there to be a referendum and seek the opinion of the residents of Artsakh? He agreed – but only after the Azerbaijani refugees had been allowed to return to their homes. I expressed concern that this was unlikely to be practical given the general wariness and animosity between the two nations, and that it would be decades before this would be possible. I explained that this re-habitation was unlikely to happen and if it was ever considered it would result in mass deportations of Azeris into the region to change the demographics. And given the overt anti-Armenian policy by the Azerbaijani Government how was this ever going to be accepted. He looked at me somewhat quizzically. I told him, how could the people of Karabakh consider such a proposition from a Government that was threatening to shoot down civilian planes. He laughed, nervously, as though I was joking. I repeated it, more emphatically – “it is the policy of your Government to shoot down civilian planes flying into Stepanakert ( Khojaly) airport”. He tried to pass it off as the ramblings of a few extreme Azeris who did not represent the government. I advised him not to believe me and to go and visit any Azerbaijani news website, and see for himself. “That is what your Government is threatening to do; how can that be consistent with any sensible peace discussions. How do you expect the people of Artsakh to ever trust your Government?” He was looking visibly shocked with some disbelief. Whilst my objective had never been to convert anyone I did want to sow some seeds of doubt in their minds about the events in Khojaly and to get them to raise questions of themselves about what they were being told by the Azeri authorities.